When the ship shown on this page was laid down at Harland & Wolff, Belfast, she was named Belgica, and was intended for the Hamburg-American Line. During construction, though, she was sold to the American Transport Line; she was launched for ATL in October 1899 named Michigan. She was immediately chartered to the National Line, and made her maiden voyage, Belfast-London-New York, on 14 December 1899. Michigan remained on National's London-New York service until September 1900. 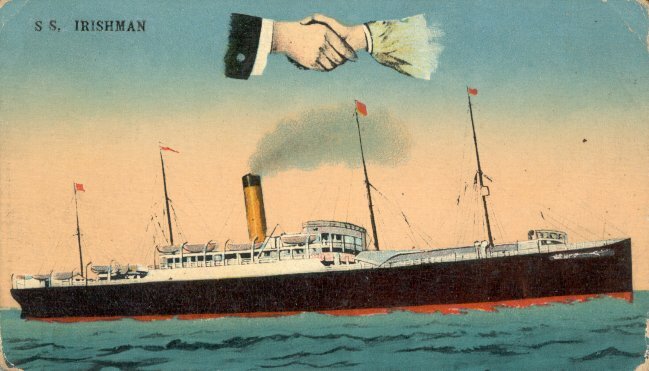 The ship was then transferred to the Dominion Line in 1904, and renamed Irishman, a name that stayed with her even after she was transferred to the Leyland Line in 1921. Irishman was broken up in 1924. Sources: Bonsor's North Atlantic Seaway; Haws' Merchant Fleets in Profile; Moss and Hume's Shipbuilders to the World.